Are Fireworks Illegal in Jacksonville FL? Are There Any types of Fireworks That Are Legal in Jacksonville FL? 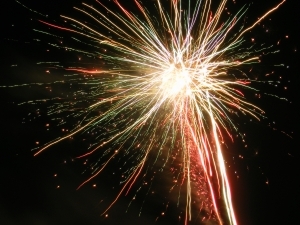 What is the Law that Prohibits Fireworks in Florida? (1) Except as hereinafter provided it is unlawful for any person, firm, copartnership, or corporation to offer for sale, expose for sale, sell at retail, or use or explode any fireworks; provided that the board of county commissioners shall have power to adopt reasonable rules and regulations for the granting of permits for supervised public display of fireworks by fair associations, amusement parks, and other organizations or groups of individuals when such public display is to take place outside of any municipality; provided, further, that the governing body of any municipality shall have power to adopt reasonable rules and regulations for the granting of permits for supervised public display of fireworks within the boundaries of any municipality. Every such display shall be handled by a competent operator to be approved by the chiefs of the police and fire departments of the municipality in which the display is to be held, and shall be of such a character, and so located, discharged, or fired as in the opinion of the chief of the fire department, after proper inspection, shall not be hazardous to property or endanger any person. Application for permits shall be made in writing at least 15 days in advance of the date of the display. After such privilege shall have been granted, sales, possession, use, and distribution of fireworks for such display shall be lawful for that purpose only. No permit granted hereunder shall be transferable. (2) A sparkler or other product authorized for sale under this chapter may not be sold by a retailer or seasonal retailer unless the product was obtained from a manufacturer, distributor, or wholesaler registered with the division pursuant to s. 791.015. Each retailer and seasonal retailer shall keep, at every location where sparklers are sold, a copy of an invoice or other evidence of purchase from the manufacturer, distributor, or wholesaler, which states the registration certificate number for the particular manufacturer, distributor, or wholesaler and the specific items covered by the invoice. Each seasonal retailer shall, in addition, exhibit a copy of his or her registration certificate at each seasonal retail location. Why Do They Sell Fireworks in Florida if They are Not Legal? If I Use Fireworks in Florida, is a Serious Crime? As a Jacksonville criminal lawyer, I do not want to say that using fireworks is not a serious crime, because every crime is serious when it happens to you. Every crime can create a Florida criminal record. However, it is a minor offense. Under Florida Statute 791.06, it is a first degree misdemeanor. You may be arrested for it or given a criminal citation. If you are only given a citation, do not think that it is the same thing as a Florida speeding ticket. It is not. If you are arrested or given a citation, contact a Jacksonville lawyer at (904) 564-2525.